There are nine new Grocery offers from SavingStar available from today. 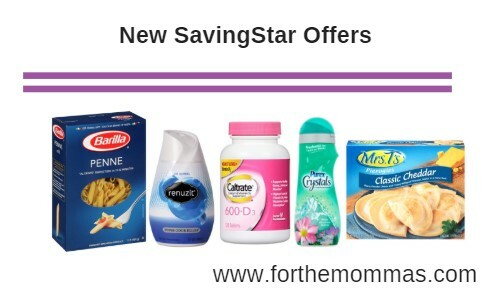 You can save up to $12.00 on a Purex, Barilla, Garnier, Caltrate, Sparkle and more with the newest SavingStar offers. Save $1.00 when you buy any FOUR (4) boxes of Barilla® Blue Box Pasta..Expires 11/4/2018.Save $1.00. Save $1.00 on THREE (3) boxes of Mrs. T’s® Pierogies..Expires 10/13/2018.Save $1.00. Save $2.00 on any ONE (1) GARNIER® Nutrisse or Olia Haircolor product..Expires 10/6/2018.Save $2.00. Save 50¢ on any ONE (1) Purex® Crystals™ In-Wash Fragrance Boosters (any size)..Expires 9/23/2018.Save $0.50.